The palest ink is better than the best memory. A Great solution to keep your great idea fresh and plans proceed in order. The White Board can be adsorbed to metal surface, Like Refrigerator, Blackboard, Office. Keep track of your Date, Business travel, Gift-giving, Personal visit, Make sure everything is going well. Easy to clean: The plan organizer is made by latest high polymer material, which is also used in anti-scratch protective layer for cell phone screens, that will efficiently avoid markings and stains from old notes. 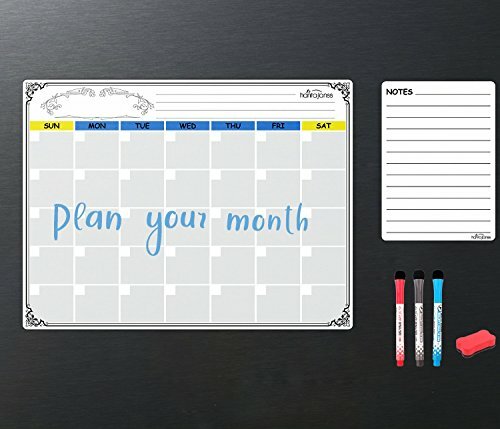 Large size:The size of the monthly calendar: 16.5"WX12.5"H, The size of the note: 5.7"WX8"H.
3X Fine dry erase markers，Color options of the pen: Black, Blue, Red. NEW PREMIUM MATERIAL: High quality PVC, Easy to be erased, Stain resistant, No air bubbles - It is covered with special coating and can be easily erased even after 30 days. MAKE SURE EVERYTHING IS GOING WELL: Write down your monthly plan on this organizer& implement it on time, Make your plan process step by step. TEACH Self-discipline HABITS - Teach your kids the value of goals, planning ahead & showing up on time. Kids will sucess if they process the plan every day. NEVER MISS AN IMPORTANT DATE - Do you have a lot of stuff in your life to keep track of? Check the calendar what plan do you have after get the milk, A calendar will restore order and certainty to your everyday routine. If you have any questions about this product by HANTAJANSS, contact us by completing and submitting the form below. If you are looking for a specif part number, please include it with your message.